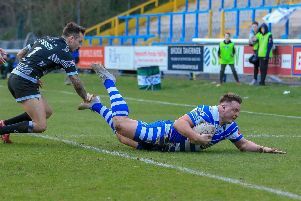 Halifax coach Richard Marshall declared himself “relatively pleased” with his side’s progress after they concluded their pre-season programme with an 18-18 draw at Championship rivals Featherstone. Fax needed a late touchdown from centre Steve Tyrer, who also kicked the conversion, to draw level, although Marshall’s side looked the more dangerous team for long spells. “I think it was a good game for both teams,” said Marshall, whose side trailed 12-6 and then 18-12. “We both wanted a more intense game; for us that’s our final run through before we go to Widnes. “It probably did us good to go behind and have to come back; that showed some attitude, some resilience. “We didn’t have it all our own way and we finished strongly again. “We bombed a few chances, plays and combinations that we have been working on. “Our timing was out a bit and we panicked a little on the edges at times. “I must commend Featherstone’s efforts, they stepped up for a new coach. “We had momentum in that first half and we were getting at the right people, making space and creating overlaps. “We had a young team either side of half time and we still have some guys to come in to the team. “We need a bit more direction round the halves. “I thought Ben White did pretty well again, but we didn’t get to enough kicks. “We’re trying to put plays on in good ball, which is great, but there’s also occasions when you need to finish your sets. Marshall admitted he has selection decisions to make before the trip to Widnes on February 3, although one player who has nailed down his spot is winger Will Sharp. “I thought Will was immense, outstanding,” said Marshall, who lost another back, James Saltonstall, with a hamstring strain after an impressive start at centre. “A cold, dreary January afternoon and he doesn’t care where he is, he was fantastic and all being well he’ll be in our team in round one. “James has pulled his hamstring, so it can be anything from a week to a few weeks. “We’ll see how he goes with some rehab, he was playing well at centre. “We have some questions and some headaches over selection.